Within the walls of the monastic compound of San Gregorio (begun 1623) stood a circular kiva, a Pueblo structure used for religious ceremonies. This unusual combination of Christian buildings and kiva stands witness to the negotiations that must have transpired as friars, with their Catholic practices, beliefs, and desires encountered and engaged Native Americans in New Mexico. The kiva was once centered in the main patio of San Gregorio’s earliest incarnation (1623-1629). The walls of the monastic complex are made of the same stonework as the kiva. This, and other archaeological evidence, suggests that the kiva formed an integral part of the first construction campaign. Up until 1645, when a second patio was built at Abó, the kiva seems to have served as a fully functioning space within San Gregorio. The circular kiva seen in the foreground would have originally been roofed, so that the interior of the sunken room was not visible from the plaza. Entry into the kiva would have been by ladder, leading from the plaza, through an opening in the roof to the room below. In 1623, Fray Francisco Fonte began the first major Christian building project in the Pueblo community of Abó, not far from modern-day Albuquerque. Using indigenous labor, Franciscans would renovate and enlarge San Gregorio twice before it was abandoned. The result was a series of buildings of wood, sandstone, and adobe for Christian worship as well as the daily activities associated with the mission: cooking, storage and the tending of animals. The walls of the kiva, like that of the monastery behind it, are made out of roughly cut stone. This was once likely covered with smooth mud plaster. Given the 17th-century date of the complex, it seems likely that the main part of the complex would have followed Franciscan designs, but the kiva was designed by the Pueblo, who also provided the labor and technical knowledge for building with local, New Mexican materials. In the coupling of monastic design with indigenous labor and technology, San Gregorio follows the pattern set by earlier monastic architecture across Spanish America. This Pueblo town was abandoned in the 1670s, the result of drought, famine, and Apache raids. 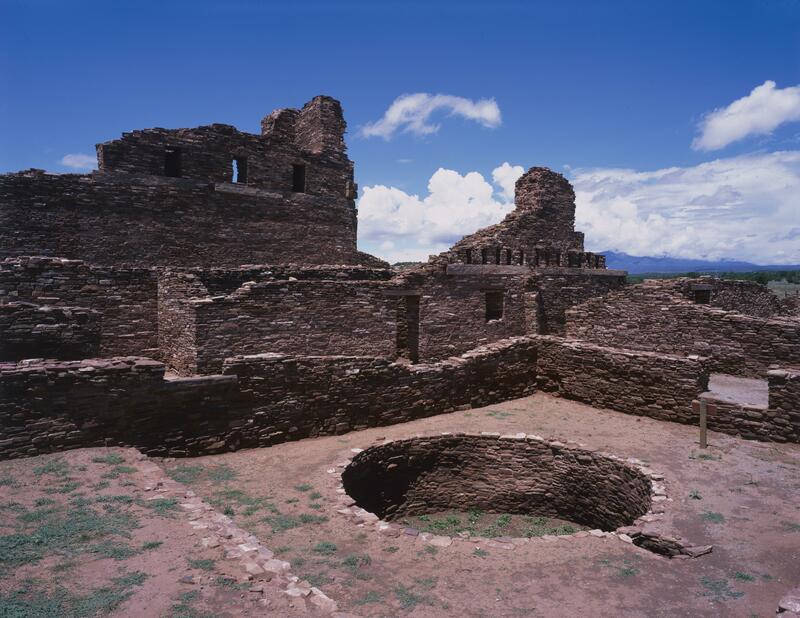 Today, the excavated ruins of the kiva are part of the Salinas Pueblo Missions National Monument, located near Mountainair, New Mexico and maintained by the United States National Park Service. 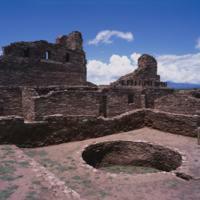 While rare, the kiva-monastery compound at San Gregorio is not the only one known in New Mexico. It dates to a time when the conversion efforts of Franciscans there were still young. This architectural combination testifies to the inter-cultural practices and spaces that Franciscans and Pueblos produced in the 17th century, as they struggled to understand each other. It also implies how hopes for, and beliefs in, the world beyond daily existence were fashioned of stone and wood and compromises. Ivey, James. 1988. In the Midst of Loneliness: The Architectural History of the Salinas Missions. Santa Fe: New Mexico: Southwest Cultural Resources Center. Treib, Marc, 1993. Sanctuaries of Spanish New Mexico. Berkeley: University of California Press.